The aerosol chamber LEAK (Leipziger Aerosolkammer) was built for studies on the formation of biogenic and anthropogenic secondary organic aerosols (SOA). Main focus of the experiments is the study of the formation biogenic SOA formed during the ozonolysis of terpenes (β-pinene, α-pinene, limonene). Furthermore the reaction of isoprene with OH-radicals and ozone is studied. Aim of these experiments is the elucidation of reaction mechanisms as well as the determination of the influence of reaction conditions and seed particle properties on formed particulate products and SOA yield. Additionally, experiments are performed to study the SOA formation during the OH-radical reaction of anthropogenic emitted organic compounds. The SOA formation and particulate products in the processing of exhaust of the combustion of wood and pellets is also investigated. Therefore, LEAK can be connected to the Leipzig Biomass Burning Facility (LBBF). LEAK is made of Teflon FEP film. The chamber has cylindrical geometry, a volume of 19.0 m3 and a surface/volume ratio of 2.0 m-1. 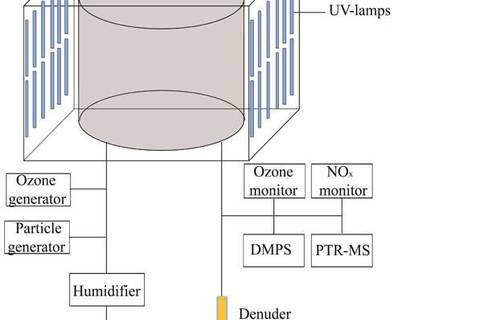 LEAK is equipped with a humidifier, an ozone and a particle generator. Fifty-six UV lamps (100W Eversun Super, Phillips) are used to illuminate the aerosol chamber (cf. Fig. 1). 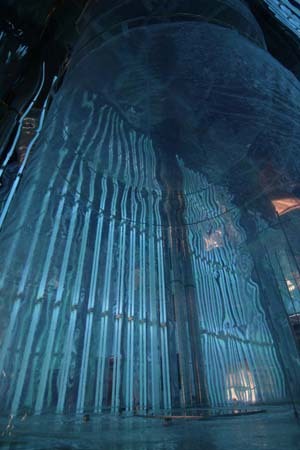 To maximize the light intensity in the chamber, reflective aluminum sheeting covers the walls of the enclosure. A 12 kW heat exchanger controls the temperature of the insulated enclosure housing the Teflon chamber. 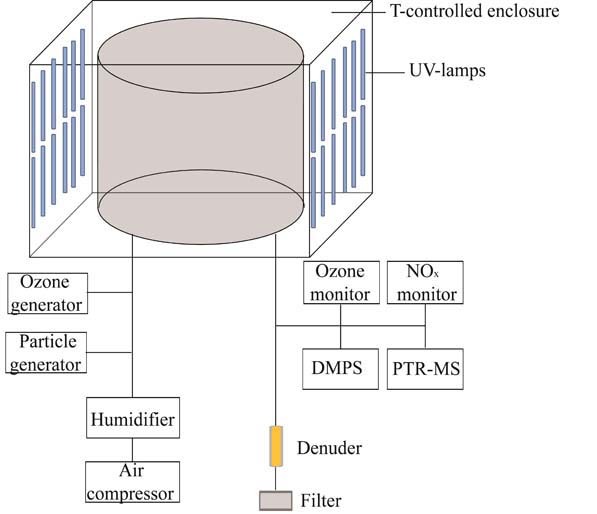 Outlets of the chamber are connected with a condensation particle counter (CPC), continuous monitoring ozone and NOx analyzers and a particle sampling filter device with a fixed integrated annular denuder to avoid gaseous contamination of the deposited particles during sampling. The size distributions of particles in the aerosol chamber as a function of time are measured by a twin scanning mobility particle sizer (TSMPS). An Agilent gas chromatograph (GC) with flame ionization detector and a PTR-MS (Ionicon) monitor gas-phase hydrocarbon concentrations in the chamber (cf. Fig 2). 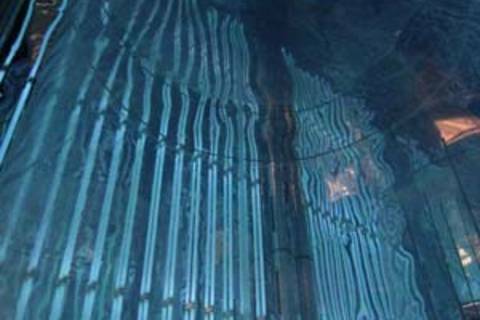 View into the enclosure with the UV-lamps.